Been partying to hard last weekend at ADE? Got ringing ears from all the beats and tiresome toes from all the dancing? Actually feel like staying at home this weekend? Well don’t! Because we got the best recipe for last Monday’s hangover: a brand new edition of Zondagmiddag! You already knitted at Roest, hottub-a-dubbed at VLLA, and hoolahooped the day away at Studio/K. Now, we have picked a brand new location to host Overdose.am’s travelling cultural fair, and it will be at Amsterdam’s hotspot Pllek! We will once again provide you with vintage knitwear, groovy tunes and fine food in a cosy atmosphere. 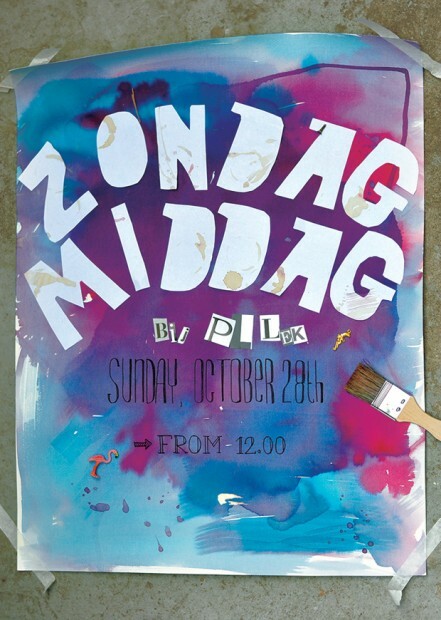 So this Sunday, get off your couch and hop on ours: Zondagmiddag at Pllek! Together with local designers, acoustic heroes and culinary fanatics we will offer you another unforgettable afternoon. To make sure you can start your Sunday at ease, Pllek will provide you with a relaxing Yoga or Tai-Chi session before hitting the market. After you’ve flexed your muscles, you can stroll along the endless stalls that offer exclusive fashion at an affordable price. With your new outfit in hand, you can sit down and get a quick haircut or a good shave from your personal barber. For the ladies, we’ve even invited a nail artist with a big heart. While you’re sitting in a comfy chair, writers, poets and musicians will stroke your ears with spoken words and harmonious rhymes. To still the appetite you can get some traditional Dutch stroopwafels or enjoy a high quality lunch at Pllek’s restaurant. Remember to save some room though, because we will be serving up a luxurious 3-course dinner as well. Want to join? Send an email to zondagmiddag@pllek.nl and make dinner reservations for you and your friends. Before heading home all satisfied, you can finally doze off while watching a classic movie at our indoor cinema. Don’t miss out on the most relaxing highlight of the month. If you have any more questions, just check out our Facebook event for all the information you need. Feature image courtesy of Josée van Dijk.